Aliens transport humans to a strange city in space as part of an experiment. Rufus Sewell and Jennifer Connelly are compelling and sympathetic as a married couple with some serious problems. Shots of buildings morphing are terrific, thanks to Visual Effects Director Bruce Hunt. 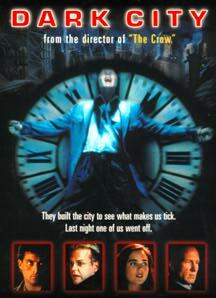 "Dark City" is bold and provocative, a refreshing change from the numerous "Alien" and "Star Wars" ripoffs. The cast includes: Rufus Sewell, Kiefer Sutherland, Jennifer Connelly, Richard O' Brien, Ian Richardson, and William Hurt.